Heat killing your plants? Tips for watering your garden. A dry rain barrel and cracks in the soil are good indicators of the state of my landscape. We are still faithfully watering the garden and watching the forecast for cooler temperatures. At this point, I would consider 90-degrees a cold front. I briefly spoke to a fellow gardener this morning; he’s fed up with watering and nursing along his pumpkin plants. “It’s too darn tough to keep them alive, not worth my time right now!” he exclaimed. I’m not so quick to give up! 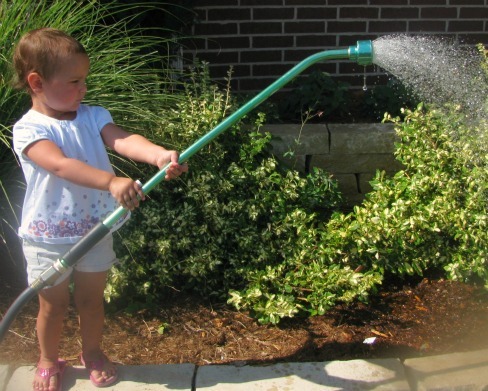 I have three little girls who are great at watering “Mommy’s Garden.” Not that they ever complain (wink, wink). Our local horticulture extension agent, Rebecca McMahon, writes an excellent garden blog, entitled The Demo Garden Blog. I faithfully follow her posts. While you are inside, enjoying the benefits of air conditioning, check out her blog. I know it will improve your gardening as much as it has mine. Last week Rebecca put together a list of watering tips. I couldn’t come up with a better list so I am sharing hers with you. Water in the morning if at all possible, especially if you are using a sprinkler. This way plants will have the water available to them when it gets really hot in the afternoon. Water thoroughly, not just a little sprinkle. Make sure the water soaks in, down to at least 8″ deep, and more if possible. Use a screwdriver to test if the soil is soft down deep enough. If you are watering thoroughly, you shouldn’t need to water every day, unless you have a sandy soil. If you have a clay soil, check before watering again. Try to avoid getting the plants wet when you water, especially tomatoes. Other plants are less affected by overhead watering, but getting the tomato foliage wet will drastically increase incidence of disease. And, the plants don’t absorb water through the leaves, just the roots. Put the water where it will count! If you check on your plants during the heat of the day, and they look droopy, DO NOT automatically water them again. Check the soil to see if it is dry on the surface and a few inches down before watering again. It is really easy to get into a habit of overwatering during a hot spell. Rebecca also created a video demonstrating different techniques and tools for watering your garden. Now that you know what to do, hang in there…. even though it is just too darn hot! Happy Watering!